The thickness of your copper sink does matter! Our 14 gauge copper sinks are much thicker and heavier than 16 gauge sinks, making ours much more resistant to denting from pots and pans. The thinner 16 gauge copper kitchen sinks can be noisy, sounding "tinny" or "hollow", and they will not stand up long-term. We stand behind our quality and only sell copper sinks that are heavy, durable, and made to last a lifetime! SoLuna hammered copper kitchen sinks come in four different finishes - Matte Copper, Rio Grande, Dark Smoke and Cafe Natural. 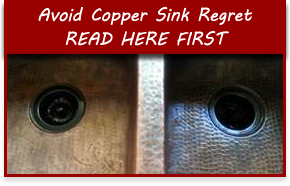 Farmhouse copper sinks are also referred to as copper farm sinks or copper apron sinks. We are happy to create a custom order for you. If you're interested in adjusting the dimensions or making other modifications please feel free to call us Monday - Friday, 7am - 4pm PST at (360)321-2131. I contacted Copper Sinks about the copper farmhouse sink with questions as I did not really know anything about a copper sink. They were very helpful and informative. After other research, I placed the order and it arrived on time well packed in a wooden crate with styrofoam lining inside. Very impressive. The sink is now installed and it is absolutely so beautiful. The plumber who installed the sink for me was equally impressed and wants one for himself! The Rio Grande color is amazing!!! Thank you Copper Sinks! These sinks are stunning!!! Just gorgeous!!! Haven't installed yet, but LOVE the quality, color, etc! There is absolutely no comparison between what this company sells and sinks we found elsewhere. We are highly satisfied. I absolutely love my copper sink. At first I cleaned it back to copper, but then decided to let it go natural and I’m so glad I have. Our kitchen is still not complete that I have had an opportunity to wash cast-iron skillets and cookies and love not having to worry about the sink. The purchase shipping etc. all went wonderfully smooth Lee and all of the employees were very pleasant to deal with. The quality of this one is excellent. Love the look and function of our new copper sink.